Hex River Valley Plum And Nectarine Cheesecake. 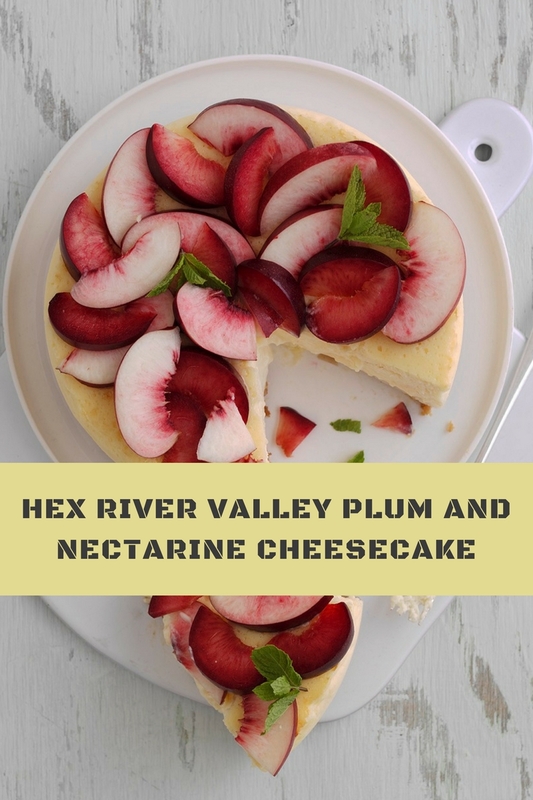 Today I am sharing this Hex River Valley Plum and Nectarine Cheesecake recipe with you. This amazing baked cheesecake tastes divine topped with luscious South African plums and nectarines. 1 Adjust the oven shelves – you need to bake the cheesecake in the centre of the oven. Preheat the oven to 180°C, fan oven 160°C, Gas Mark 4. Brush the base and sides of a 20cm (8 inch) spring-form cake tin with melted butter or vegetable oil, then line with baking paper. 2 Melt the butter in a saucepan, taking care that it doesn’t get too hot. Add the biscuit crumbs and caster sugar and stir well to mix with the butter. Tip into the cake tin and press into an even layer. Transfer to the oven and bake for 10 minutes. Remove and leave to cool on a wire rack. 3 Increase the oven temperature to 220°C, fan oven 200°C, Gas Mark 9. In a large bowl, beat the soft cheese for a few seconds with a hand-held electric mixer on a low speed. Gradually add the caster sugar on a medium-low speed. Sprinkle in the cornflour and beat again for a few seconds. 4 Using a fine grater – a microplane is ideal – grate in the lemon zest. Add 1tbsp lemon juice, stir it in, then add the vanilla bean paste or vanilla extract. 5 Add the eggs a little at a time to the cheesecake mixture, beating between each addition on a medium-low speed. Add the double cream, folding it in with a large metal spoon to give a smooth, light, quite thick consistency. 6 Tip the filling over the biscuit base. Bake for 10 minutes, then reduce the temperature to 110°C, fan oven 90°C, Gas Mark ¼. Bake for 35 minutes. The cheesecake should wobble slightly in the centre. Turn off the oven and leave the cheesecake in the oven for 1 hour. Cool at room temperature, then cover and refrigerate. 7 When ready to serve, decorate the cheesecake with the sliced South African plums and nectarines, adding a few mint sprigs if wished. Cook’s Tip: For a change, use South African peaches instead of nectarines. Hex River Valley Plum And Nectarine Cheesecake Recipe c/o South African stone fruit. 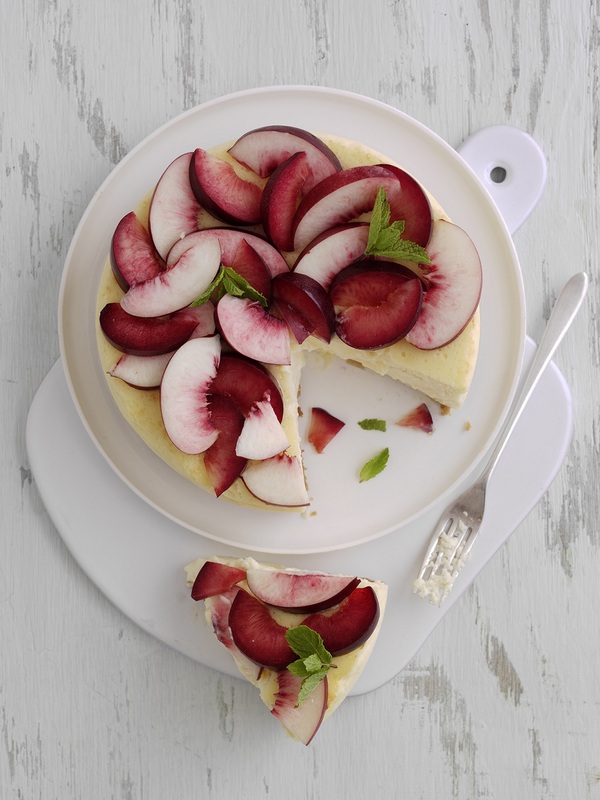 What do you think of this Hex River Valley Plum and Nectarine Cheesecake recipe? Baked Mascarpone And Lemon Drizzle Cheesecake. Earl Grey And Clotted Cream Cheesecake. Superbly Easy To Make Ginger And Orange No-Bake Cheesecake. How To Make A Perfect Baked Cheesecake. "Superberry Kale And Roasted Garlic Bruschetta"
You have the most beautiful food! Thanks for sharing at Home Sweet Home.